Single Sliding Metal Track Cooler/Freezer Door – Manual or Power | Dock Door Systems Inc. 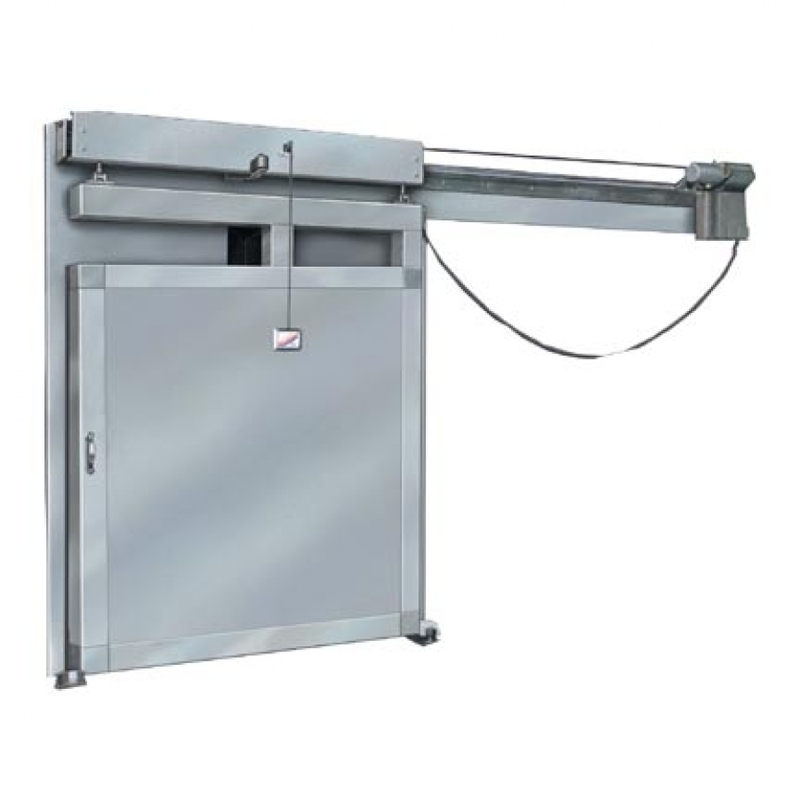 The premier quality insulated door for coolers and freezers in meat packing facilities. Unitized high strength galvanized steel panel with pour-type polyurethane insulated core and 20 ga. galvanized steel finish. Available in 24 ga. embossed white stucco, 20 ga. stainless steel, or other colored metals. USDA approved. Full perimeter gaskets.Heavy-duty hardware.16 ga. formed galvanized steel capping with cast “Almag” corners. Instant reversing edge effective full height and travel of door. HDS (Hydraulic Dual Speed) at 40"/sec. open; 20"/sec. close. Instant reversing edge along full height and travel of door. Pedestrian opening (in door pushbutton for partial opening-automatic time delay close, all adjustable). Extra pull cord or single push button activation device (2-pull cord standard). b) Inside hasp flush mount. c) Lock with power cut off. d) Lock w/power cut off and inside emergency release. Windows: 12" x 12", 2 or 3 lite, heated or unheated.